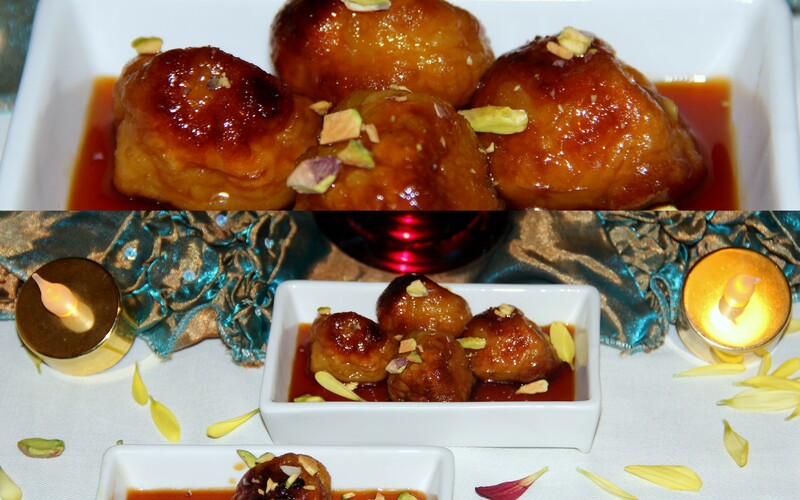 Gulab Jamun is among India’s most popular desserts! This delicious dessert consists of dumplings traditionally made of thickened or reduced milk, soaked in rose flavoured sugar syrup. Here in this recipe I used potato in place of milk solids and opted to bake. Baking does not colour evenly unlike fried but cooked inside; baked versions are low in calorie and requires very less oil or butter to cook them. So for those who cannot indulge deep fried goodies here is a baked version just to fulfil their sweet cravings. Pre-heat the oven at 160 deg C. Line the baking tray with baking sheet and set aside. Now grease your palm with butter/oil and make small lemon sized balls of the dough. Then add maple syrup if required (as per the taste) and rose essence mix well. Turn off the flame and set aside. Drop the baked jamuns in the dates syrup and let it soak for 2-3hours and then transfer to the serving bowl and top some nuts and serve. The potato ball may not turn golden colour evenly on baking but it will be cooked inside. Soaking for long helps for even absorption of syrup and sweetness. Maple syrup is used since dates syrup is more concentrated and it helps to reduce dates concentration. Posted on October 21, 2014, in Indian, Sweets and tagged Deepavali sweet. Bookmark the permalink. 9 Comments. This is extremely interesting Chitra 🙂 and looks delicious! !